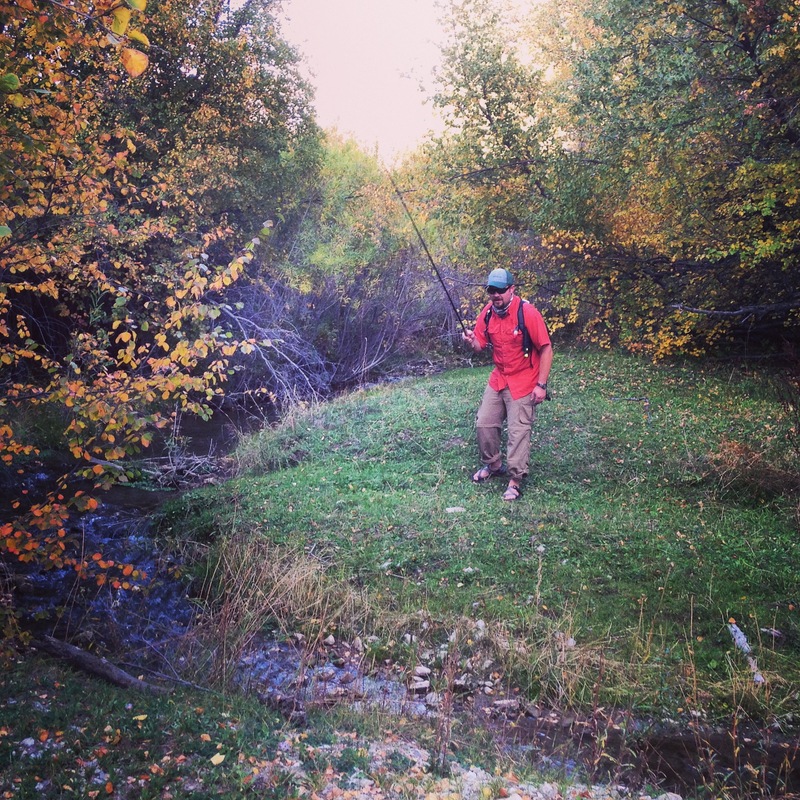 It had been three years since I fished this creek. The last time I fished it was in July of 2013 with my Dad, Keith Wayment. Dad asked me what I wanted for my birthday and I responded: “To go fishing with you!” Dad agreed and showed up early Saturday morning with a box of his hand tied flies and a twenty dollar bill for my birthday. While the gifts were appreciated, I was just glad to spend the day fishing with him. Dad fishes with my Brittanys on Birch Creek in 2012. Our first stop for the day was a large creek on the Idaho-Wyoming border. Anywhere else, this creek would have been considered a river. However, like all the creeks in the area, it was overshadowed by the goliath Snake River downstream. This creek has a proper name, but I like to give small creeks nicknames just like my grouse coverts to protect them and to endear them more to me. At one time, I kicked around the name of “June Creek” because in the month of June bigger fish run up this creek and you can catch them just as the runoff drops and the creek clears. In mid-June of 2013, a friend and I caught numerous nice trout on this creek. However, Dad and I went there mid-July and, by then, the bigger fish had moved back downstream. I caught a few skippies, but Dad got skunked. Before he could figure things out, we had to abandon the area because of a black storm cloud and rain. We stopped at a few other creeks on the way home and Dad finally caught a cutty on a creek I call “Siren Creek.” This was one of the last fishing trips I had with Dad before he passed away the following spring. Life got hectic over the next three years and I never could seem to find my way back to this special creek, until yesterday. My law partner, Aaron, asked me to take him and his son David fishing and this seemed like the perfect place. Since it was June, I hoped that we would still find some of bigger fish. Also, with it being Father’s Day weekend, I thought this would be a good place to go and remember Dad. Upon arrival, we found that the creek was a little off-color which—I thought—was perfect conditions. However, the big fish were not as abundant as in 2013. I’m not sure what made the difference, but we had a harsher winter this past year. Unlike the last time, however, there was not a cloud in the sky. I strung up the 2 Weight St. Croix Ultra Legend fly rod that my Dad built and tied on one of his Red-butted Double Renegades. This seemed like a good combo to begin with. 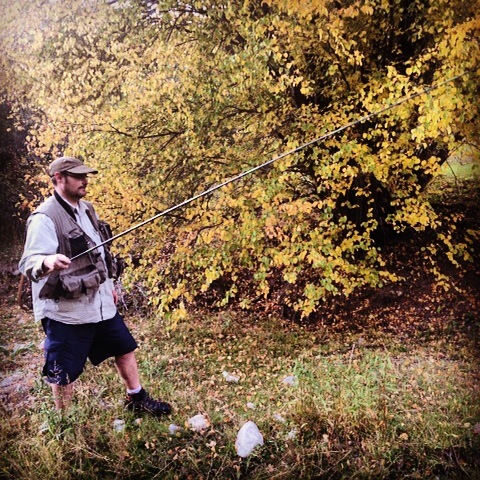 When I fish, I like to keep moving upstream. I call this “running and gunning.” I’ll stop and fish the better holes for a while, but if I don’t get a strike after numerous casts, then I keep moving and searching for the primer spots. As I headed upstream I caught numerous small cutthroat, but no big ones. I worked up to the head of a long, aqua-green run and skittered a Renegade across the seam between two currents. A beautiful yellow cutthroat rose, but missed the fly. That is a bigger fish! I thought to myself. I tried dead drifting the fly, but the fish ignored it every time. After skittering the fly cross-current four or five more times, the aggressive fish finally got ahold of it and he was on. This cutty gave me a good fight on the two weight and I ended up landing him about 20 yards down river. I was excited about the nicer fish and thought how cool it was to catch him on a rod built by Dad and a fly that he tied. Snake River Fine Spot Cutthroat on Dad’s fly rod and Red-butted Double Renegade. I then went back downstream to check on Aaron and David, who stayed near the vehicle. 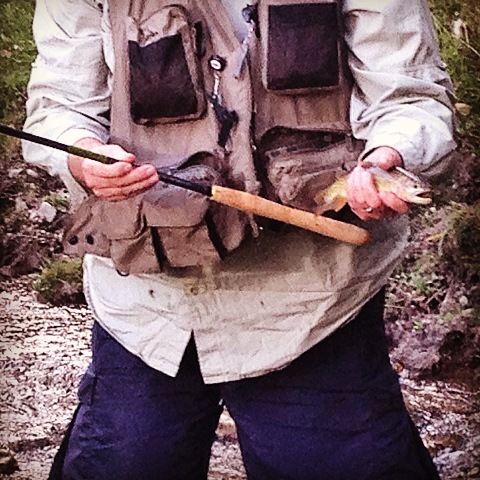 In my absence, Aaron had caught a big cutthroat on a rubber leg. 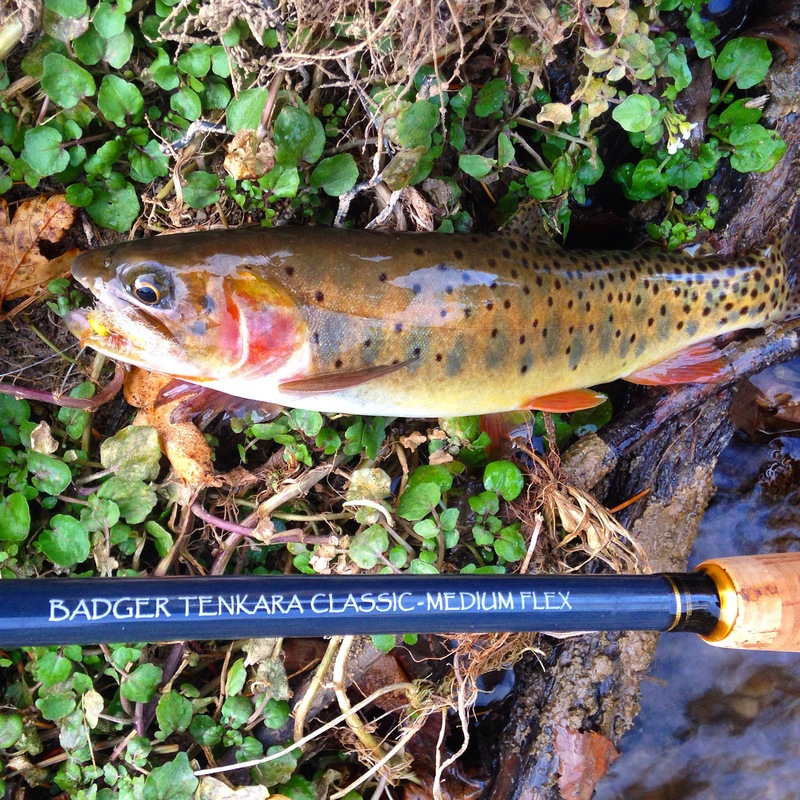 Since the fish were biting dry flies, I decided to switch over to Tenkara and a Renegade, which was the perfect combo. As I worked my way upstream from where I had earlier left off, I thought a lot about Dad. I wished he could have experienced this creek in its glory. He would have loved its boulder strewn runs and pockets, though he may have had some trouble wading the slick, boulder-laid bottom in some areas. 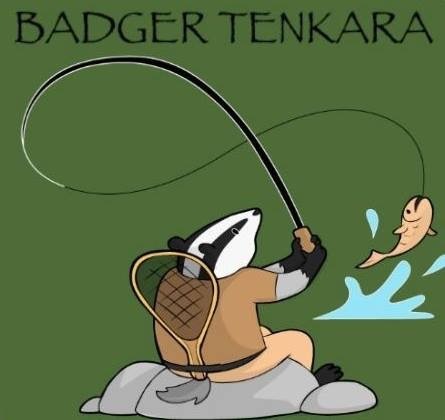 Although he never heard of it during his lifetime, Dad would have liked the simplicity of tenkara. A man of faith, he would have appreciated that tenkara means, “from heaven” in Japanese. 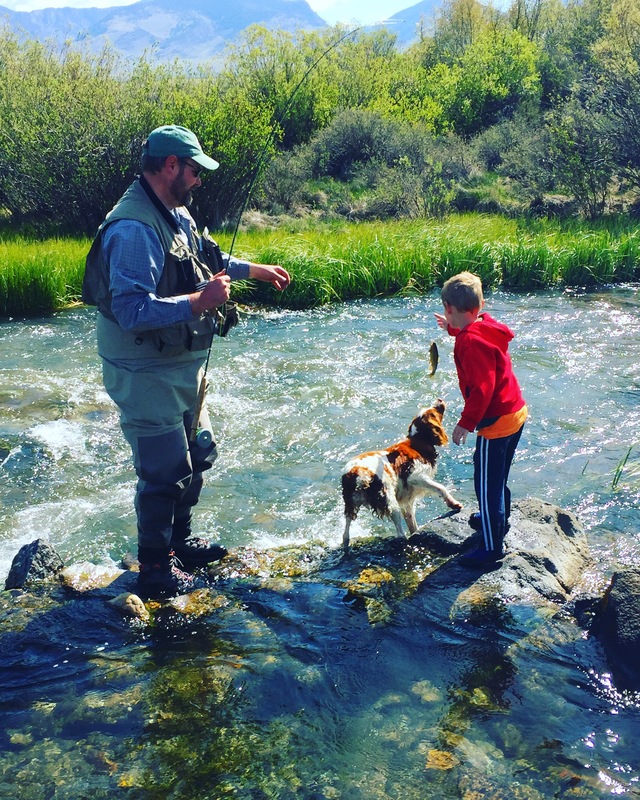 Of all people, Dad understood the strong spirituality that is connected with fly fishing and the outdoors. “June Creek” is a little generic of a name, I thought to myself. Maybe I should name this creek after Dad. As I was thinking about these things, I came upon a dark green hole that just screamed of fish on the left bank. 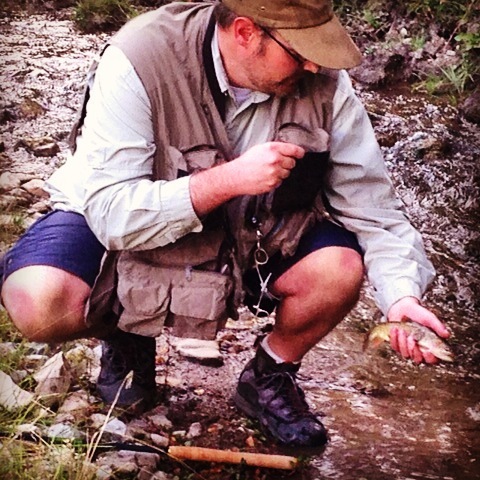 I cast the Renegade into the run and the biggest cutthroat of the day rose and engulfed the fly. Upon setting the hook, the fish gave me a wonderful scrap and just as I was almost ready to land him, my tippet snapped. I knew there was a knot in my line that I should have fixed when I tied on my fly and that was my undoing. I had just lost the fish of the day and all I could do was smile. Dad, who had a great sense of humor, would have appreciated that. As I reflected on my own father, I was amazed that I stumbled upon a memorial that another family had posted for their dad. Somehow, I don’t think this was a coincidence. I resolved right then that the name of this creek should be “Keith’s Creek” in honor of my Dad. I thought this was the perfect tribute to my hero and father.